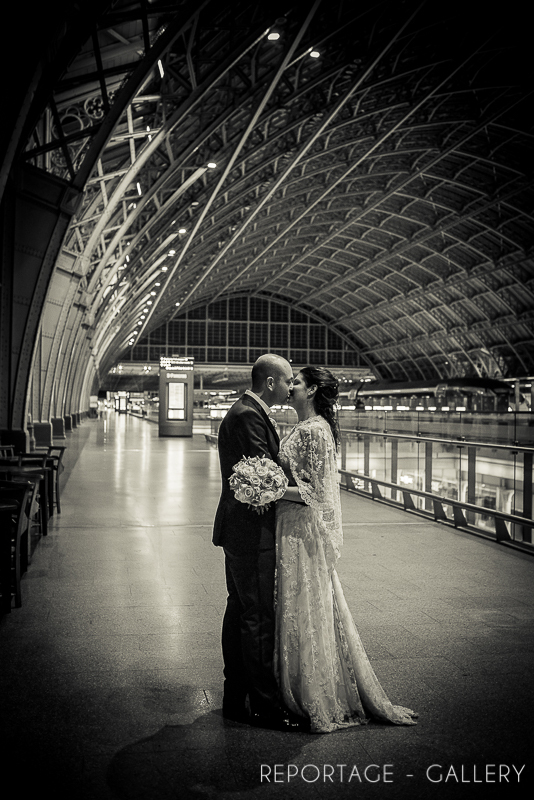 This weekend's wedding was a beautifully romantic and family-orientated day that took place at the iconic Renaissance Hotel in St Pancras. The couple managed to plan a day that was both elegant and informal - no easy task - and the evidence of this, we hope you'll agree, is in our pictures. Every wedding has its special moments, and this was one was a particularly touching - and amusing - one! On their first meeting, having heard that his daughter's new boyfriend was a Spurs supporter, the father of the bride wore his Arsenal baseball cap to greet Jamie. In revenge, on the night of the wedding, Jamie presented his now father-in-law with a very special gift; a Spurs baseball cap and, testament to his wonderful sense of humour, the father-of-the-bride put it on! We are always on the look-out for the perfect place near the wedding venue to whisk our bride and groom off to for a few minutes on their own, and London never disappoints. Just round the corner from the hotel, Kings Cross/St Pancras provided the perfect backdrop. The bride Joanna was born on the birthday of her mother's best friend, Joanna. As a wedding gift, the bride's namesake organised for the song 'Joanna' by Kool & The Gang to be played. It's moments like these that make every wedding such a uniquely personal occasion. If you are interested in finding out more about the wedding photography packages we offer, please do get in touch - we'd love to hear from you!